For about half the price of a hotel, you can hire our team of fun, creative planners, cooks and outdoor fanatics. Which Manitoba groups believe that retreats are essential? Our finding was a surprise! It’s not limited to any one group but instead, it’s a huge spectrum of communities that go beyond count. People everywhere are seeking out times of refreshment, wellness, and the renewal of faith. Today after two decades of providing retreats we have formed bonds with hundreds of groups and individuals across Manitoba, Canada and the United States. Helping every group to enjoy a time of rest among the splendor of our provincial boreal forests is where we shine! We are Retreat Experts and delight in helping people along their journey. The passion of this multi-generational family run facility is to help theme, design and host a retreat that truly makes a difference. Wilderness Edge’s very own chef will provide amazing, nutritious and delicious meals throughout your stay with both healthy and indulgent options! Meals will include incredible homemade baked goods with options in your booking form for vegetarian, vegan, dairy free, soy free, gluten free and a delicious salad bar. Please be sure to inform us of any food allergies/intolerances or health issues you feel we should be aware of well before arriving. 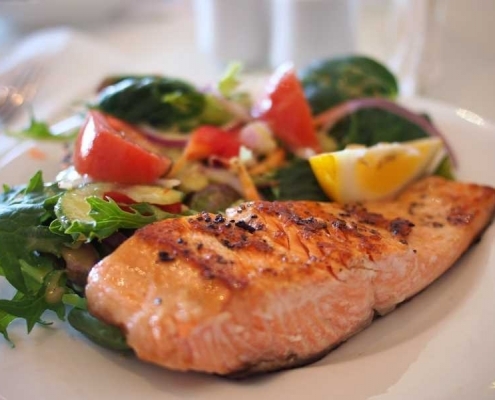 Our incredible kitchen staff can satisfy all your special dietary needs. See Catered Food Services. At Wilderness Edge we strive to be affordable and accessible to everyone. We don’t want anyone to miss out on the fun! While some retreats centers offer a programme for $200-$400 per night, we’ve worked hard to offer great value for a much lower cost! Registration fees run from $49.50 and up, per night with meals. Night snack on the day of arrival, followed by 3 delicious chef-prepared meals and a night snack on day 2, and breakfast and lunch on the day of check-out. There is always a fruit bowl and beverages accessible throughout the day. You definitely won’t go hungry! Morning start might include a soak in our hot tub, the use of local trails, canoes, or a quick snowshoe down a trail. For those wanting the less vigorous, take a long breakfast before starting your first group session. Spend a little bit of time gazing occasionally at the Winnipeg River and the frequent deer crossing our property. Evening entertainment might be a campfire, talent show or eating cookies during night snack and telling stories. Whatever it is, it is bound to be filled with fun, laughter, and adventure! The Conference Centre is surrounded by trails, forests, wetlands and a local sandy beach. The main dining hall overlooks the Winnipeg River and there are 5 large meeting areas to pick from when booking a retreat. Fast Wi-fi is available throughout the facility and guest rooms. Wilderness Edge is nestled in the lush Boreal forest of the Canadian shield and surrounded by the Whiteshell Provincial Park. There are extensive hiking, golf course, horseback stables, rafting, tubing, canoeing and over 80,000 square feet of indoor facility. See Things to do. If you are not familiar with retreats or the wide amount of variation with each, this information is helpful. Understanding the different kinds of retreats may give you ideas for several of your own. We have compiled and defined the most common retreat types. Disconnect from the outside world and leave work and the chaos of life behind. In this hectic, often busy world, sometimes as women we don’t get a chance to prioritize ourselves. No one understands one another like BFFs. A good laugh with your best friends on a girls’ getaway is medicine for your soul. Spiritual retreats are time set apart to be in a quiet, restful place that provides solitude with God. People have pursued spiritual retreats to encounter God and experience spiritual renewal for eons. These type of retreats remove us from the constant chatter of this world, and into a place of spiritual refreshing. Entering into the presence of God in this way allows him to nourish our soul in unique ways. As we settle into stillness, we notice the still quiet stirrings of our soul, deep calling unto deep, and God’s quiet whisper to us. Take advantage of the opportunity to spend time investing in each other. The weekend is filled with fun, laughter, learning, adventure & making lasting memories together! Whether you are trying to mend a damaged relationship or deepen an already connected relationship between you and your daughter, this Mother Daughter Retreat will be a powerful experience for you both. Not to mention you will have a blast with all of the great activities that can be planned – like cake decorating, painting and Manitoba activities like tubing, rafting, hiking, cross-country skiing, crafts, skating, and more. Retreating with a group of friends is an amazing type of retreat. Commonly 10 to 40 people with stays of a weekend or a week. The sky is the limit when it comes to how incredible you can craft these intimate weekend getaways. Themes can revolve around a birthday, Tubing and Rafting Adventures, or enrolling in an instructor lead workshop. To get the juices going over what activities are available check out Things To Do. Our local Manitoba dining experience will have you enjoying every bite! Watch Video: Brock’s Amazing Friend Retreat. Self Esteem is always something we want to encourage and build within our young people. Speak in the language that youth understand. Use weekends or a whole week to hear what each has to say. Be especially aware of those that say nothing. Work to create a safe environment for sharing without judgment. Extra chaperones that have been coached are great. Make sure to train and prepare your coaches several weeks prior to the event. Your team of coach volunteers has an important role to contribute. Aim to initiate conversation with each one of the youth. Make sure to have lots of fun Manitoba activities. Try not to make the conversion to heavy. Give them permission to have fun! Being creative is about exploring the arts and really exercising the right hemisphere of your brain. Gaining some new skills can be a lot of fun and leave people feeling renewed and confident about taking on new vistas. Bring some friends and recharge your batteries in a quest for finding the hidden artist that you are. Check out our Creative Retreat Packages. Not surprisingly Men are more attracted to physical activities and less talkative than the women. Men love to do things like hike, raft and catch fish (with their bare hands). Want to get a group of guys out? Hold a sporting event that draws some blood. Speakers that do well with the men are motivational. They address work and family issues and set off bottle rockets at the evening fireside. Bringing an empowering message, laced it with practical application, add a giant made-in-Manitoba prime steak for supper and you will have them leaning in. Keep it active, keep it moving and make it tough. You will have them coming back again and again. Father and Son Retreats is designed and structured to create a meaningful shared experience for you and your son(s). The time that is specifically spent together will help redefine your relationship and strengthen your family. This memorable weekend will incorporate Manitoba’s natural outdoor setting. It will consist of dads and sons engaging in foundations of what it means to be a son and a male in the context of family and larger community responsibility. Shared time with your son(s) might include Manitoba activities such as rafting, tubing, canoeing, body surfing, hikes, fishing, bush survival skills, campfires and more adventures! Church retreats are a fantastic way to bring your faith community together. It is a unique opportunity to spend time with one another beyond the normal routine. Often we only get to know a very small group of people in our churches. We might recognize many faces, but the depth is not there. Take time away with your group. Create a theme and set some goal. Going through a weekend or week together will certainly bring deeper relationship within the church. Escape the pressure of leadership for reflection and rest, it has important long-term health benefits. Evaluate ministry after decompressing and plan to take an extra day off once you return. Leadership retreats should be 3 to 7 days plus a day after that to gain further insights. Balance is critical when so many pressures push at you and your spouse. Set a retreat theme, goal and atmosphere and get back to the root of your ministries true purpose. If you have a place you use for church retreats you may want to ask if they have any special offers for clergy. Check out this offer for Free Ministerial Mondays. Getting away into nature is one of the most enjoyable types of retreats there are. All your senses come alive, sometimes called the feast of the 5 senses. Meditating in nature, the beauty of silence adds wood to the fire of your quest for stillness and satisfaction in enjoying the outdoors. Withdrawal from the cities and townships into the rawness of nature is a life-giving experience. Allow the sounds to soothe you, and the basking in the sun to warm you. A nature retreat is a good medicine for both your mind and body. City seclusion may be focused on things like spa’s, local parks, pathways or even cities bicycle trails. While this experience is generally for hours or a good part of the day, they are still healing in their ability to give time to rest the mind. Giving time for personal wellbeing is always an important part of a balanced life. Consider taking a drive out into the country or a local forest area. Zoos can also be a good place to just relax for a few hours. Escape your normal routine and find a place to rest. We are not located in the city, so we can not offer an Urban Retreat. Fasting is often associated with food, but it can be anything that is a regular part of your routine. The purpose of fasting is to build increased awareness in an area of your life. People will fast for spiritual reasons, devoting their time and thoughts towards the Divine. Food fasts are sometimes used to break the addiction of eating or to give your body a break from the process of constantly digesting. The important thing to remember when doing a food fast is to keep yourself hydrated. In today’s flurry of technology usage, we see a trend of more and more people fasting from their computers and cell phones for the weekend. Countless numbers of people choose to step away from routine to seek a deeper purpose within their lifetime. When done in combination with a group function there may be meetings with discussion or visiting during meal times. Simplicity, solitude, and silence are the common themes during this kind of retreat. Like the silent retreat, seclusion is a central theme and works well when planned within a retreat center. Arrangements may be made so that meals are left at the occupants’ door and only taken once the hallway is empty. Often books, scriptures or prayer books are used to speak to the mind during these times. There is no interaction with others during the time of the retreat. Directed retreats often involved a priest, counselor, pastor or retreat director. Father Bill Brennan quoted “Having a spiritual director listen to your experience of prayer can be very helpful in noticing and responding to God’s unique way of relating to you.” These kinds of retreats can be a great launching point for Silent or Solitude retreats and are helpful to those just starting out on these types of journeys. Guided retreats are also used as a tool to work through particular life struggle. Retreating with a medium group of friends is also a very common type of retreat. Usually 30 to 60 people and a weekend to a week in length. They generally revolve around themes such as Crafts, Scrapbooking, Quilting, Hikes incorporating birdwatching. Retreats with large groups of people in the 70 to 300 range are usually very organized and booked 6 to 12 months in advance. Strong central theme connects the individuals with the group. Large meetings, singing, evening talent shows and numerous small side meetings are common. Stays are a weekend to 2 weeks with 1 week as the most common length. Schedule and rhythm is the theme for a structured retreat. The direction is often provided by a retreat director, religious tradition or through written materials. Structured time can be for the entire length of the retreat or just a portion. Structured retreats are a good starting point for those whos mind seems to wander without a specific task given. Like exercise, practicing this type of technique will help bring further disciples over time. Sometimes writing in the form of journaling can assist in persons becoming more self-aware. With little or no structure the potential in this outing is increased self-aware and making new discoveries about one’s self. Finding a new rhythm with your time can help you enjoy better mental health. With less stress follows physical health, better choices and a brighter outlook. Live spontaneously and discover your purpose in the quiet uncharted places of the unstructured time. Increasing the unplanned time in your life is like adding a shoulder to a road. The extra reflection time can often help catch yourself from a crash in your life instead of just a slight course correction. Retreating with a particular schedule or goal. The schedule becomes the theme and is used to complete a project, work through some issue, start a new project or catch up on sleep or rest. Basically, you are going away with a particular objective in mind and you are single-minded in your focus. Intentionally creating a season in your life for the regular routine of self-care. These seasons can last for day or months and can be as simple as incorporating a new devotional or diary into your morning or evening schedule. Visting a park on noon hours or building a disciple. The goal of the life retreat is to form new pathways in your routine of life and give yourself an opportunity to rest and recover. Personal well being is not something that happens by accident. This may be the first step in a cascade of good choices. An early start is always a good idea if you have one day to get away from it all. Select your theme and enjoy a successful day! Starting in the morning or afternoon with the option of getting out of work early and having an evening withdrawal. Pack your bags! Overnight get-a-ways can be a lot of fun. Retreats are all about rest and reflection. Enjoy! Think a vacation with a purpose. Whether it is several days or several months the benefits of an extended time away can be truly transformative. It is not uncommon for people to take extended periods of time away to explore their purpose and expand their world. Weekend retreats offer a lot of benefits, but stretched time of rest for the mind can release a lot of stress. The longer you retreat the more time that is afforded for discover. Use your inner compass to determine the right time away that benefits your heart and mind. Regular is not in reference to being ordinary, but rather something you do on a planned and scheduled basis. It can be every month, every season or based on rhythms that occur with regularity in your life. In order have a retreating on a regular basis you will need to plan far in advance. Treasure dearly that time away. Don’t use a last-minute strategy, be methodical and deliberate. Being in the business world for many years, we would take our employees on a company outing every year. In fact, that is how I ended up owning a Conference Centre. It became our home for our corporate events. If your company is growing you will want to consider getting a whole wing or even an entire facility to yourself. Put together a small planning team. Plan well in advance and choose a location that matches your theme. You want a large meeting room and lots of fun activities. Get everyone the same T-shirt and make sure you create a schedule that includes structured and unstructured time. Other Retreats Like Yoga, Spa Weekends and even Fire Walking! There are many dozens of retreat types in Manitoba. Our above list names only a portion of all the types practiced. Everything you need for your event is here on one campus. Take a moment to read first-hand accounts and honest testimonials from real event planners and group leaders who have reviewed their Wilderness Edge experience. Thanks to Kevin and the dedicated staff at Wilderness Edge for another great stay! Rooms are always clean & comfortable, food is great and plentiful. The staff do their best to accommodate guest’s requests, including dietary restrictions & allergies. Wilderness Edge doesn’t set out to be a luxury hotel, but they certainly work to provide a comfortable and welcoming experience to everyone who walks through their doors. It’s a great location, great value for money and if you stay the weekend, you will never leave hungry. Thanks for helping us facilitate a wonderful retreat for our folks! We just spent a weekend at Pinawa with our staff member of 13adults and 7kids! We enjoyed our time and there was another larger group there too but we felt like we had the space to ourselves! We were provided with a meeting room and amazing food and snacks! Some may say there’s a lot more happening in the Summer which is true but we didn’t think any less for winter as most of our staff took in the hot tub, sauna, ping pong, spaces to play lots of the board games we brought and we also took in a Public Skate at the arena in town which was a block away. You won’t be disappointed! The staff are friendly and always have a smile! We’ll definitely go back! We were here for a leaders’ retreat. We are return customers, and we have always enjoyed our stay. The rooms are clean and comfortable, the staff is friendly and accommodating, the prices are quite reasonable, and the food is excellent! We stayed here in the spring. Pinawa is a lovely little town and the retreat center is right on the lake. Great walking trails and beautiful scenery. The food was wonderful, fresh and tasty, with lots of options. The staff was friendly and helpful. Definitely recommended. I hosted a 30th birthday party here for 24 people. There was plenty of activities to do during the winter, including curling, skating, hot-tubing, skating, snowshoeing, sauna room, and bonfire! We hosted the event in the spacious “Pinawa” room that allowed everyone to easily spread-out and participate. Food was excellent! 1. If you’d like us to host your group event — to dramatically improve your retreat, conference or gathering experience and build stronger human connections (like we did for all those groups), then claim your FREE Group Consult session. On this free phone consultation, one of our group retreat experts will discuss your goals and suggest a plan of action to increase your satisfaction rating from any previously held group event. 2. If you’d like to learn more about experiential group events and building stronger human connections on your own for free, go to our “Learning Zone” page, where you can download templates of winning group retreat outlines. Or, if you’d like us to build your organizations in-house capabilities (not for free), then contact us and we’ll discuss your requirements. 3. If you’d like to work for us—or see why our team members love working for us—then see our “Careers” pages. All of our articles are subject to our Testimonial Protocol, which is described here. Wilderness Edge Retreat and Conference Centre is a group event facility that specializes in events made easy. Our secret is breaking down events into manageable steps, and getting predictable results every time. 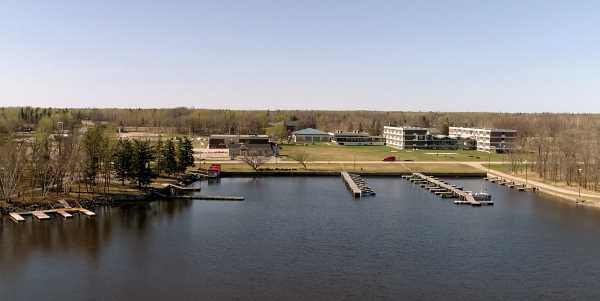 Located in beautiful Pinawa, Manitoba inside Whiteshell Provincial Park the Retreat and Conference Centre hosts retreats, family gatherings and venue solutions for conference groups across Canada and the United States. This 84,000 sq. ft. staff house, built in 1963, for Atomic Energy of Canada scientists has been wonderfully adapted featuring 5 large meeting areas, central courtyard, 100+ guest rooms & suites, large dining room. While some renovations have been necessary, Wilderness Edge Retreat and Conference Centre maintains this distinctive and time-sensitive historical mood.